Chris and I joined Kane at Martin Mere WWT today to help finish off the last few nest boxes of the Tree Sparrow's 2nd broods. Martin Mere has had a very impressive 72 breeding pairs in nest boxes this year and a handful are already on the 3rd clutch. A couple of bonus birds were Swallow pulli which breed around the reserve buildings. 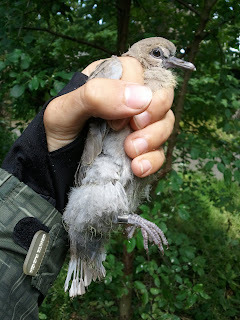 We caught 3 Moorhen by hand aswell as a brood of 2 Collared Dove which was a new bird for me and was impressed by how big the chicks were and how incredibly small the nest was! A real treat to end the day was a trip into the heart of the reserve with Chris Tomlinson (The Reserve Manager), Kane and Chris to ring a brood of Barn Owl. 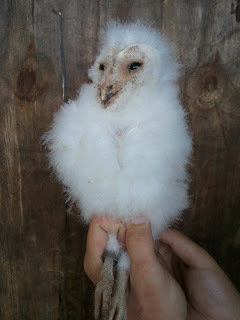 Last year Martin Mere ringed 9 young Barn Owl. The brood today was only 1 bird which is quite worrying after such a cold winter...Even with this worry at the back of our minds, the owl was passed to me and a smile was instantly put on my face. These really are lovely birds to hold as they are essentially a large ball of wool with claws! A huge thankyou to Kane for having a Schedule 1 license in order to 'disturb' the nest of this enigmatic species. An absolute joy to ring!